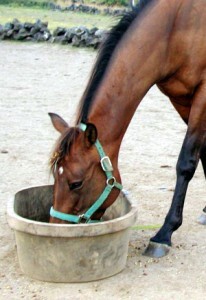 Is my horse properly taking in, chewing and swallowing both forage and feed? By observing your horse while eating hay, grass and feed, you may find that while he is taking in food he may not be actually chewing and/or swallowing it – this is especially common in older horses with poor dentition that may be quidding forages or dropping feed. The horse appears to be eating well, but in actuality the forage or feed is actually balling up in the cheeks and then being spit out by the horse. This entry was posted on Friday, July 6th, 2012 at 9:44 pm	and is filed under articles, Horse, News & Update. You can follow any responses to this entry through the RSS 2.0 feed. You can leave a response, or trackback from your own site.